From the point of view of product marketing, esthetic appearance is very important, therefore we offer our ONGROFOL® METALLIZED product for those special applications, where the appearance and nice packaging of the product is important. Metallized films manufactured by Ongropack Ltd. are in compliance with European directives and regulations related to packaging materials intended to come into direct contact with food. The base film of ONGROFOL® METALLIZED film is a clear or amber colour PVC base film. A thin layer of aluminium or copper is applied to the surface giving the silver or gold or copper colour to the material. During the manufacturing, the metallization process is performed by vacuum (10 -4 mbar), therefore the metallic layer can hardly be removed from the surface of the film. 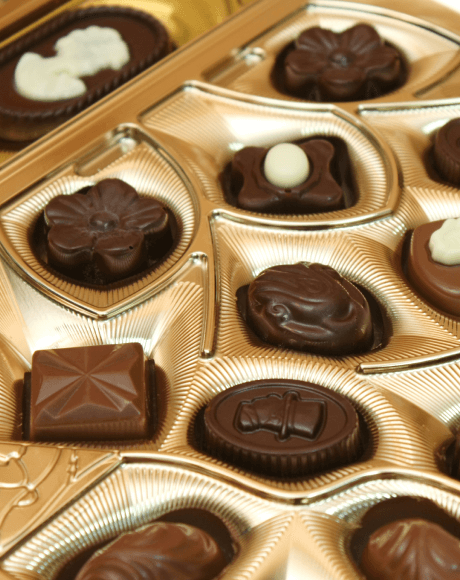 Metallized films are used mainly in the manufacturing of chocolate and sweets, where it is used as forming inside the tray or box.